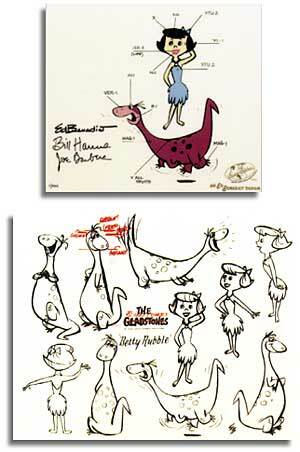 The Flintstones®, originally named ‘The Gladstones’, were developed by model sheet maker Ed Benedict for Hanna-Barbera. The color call-out model cel is an example of the art that studio painters used throughout the production. The fine art lithographic model sheet is recreated from the original model sheet by Ed Benedict. This hand-painted limited edition cel is signed by small screen legends and creators Bill Hanna and Joe Barbera, and Ed Benedict.